Classic Art first opened in Stratford over 140 years ago in 1888 by Walter McMillan. It was originally named McMillan and Neff and located at 10 Ontario Street. 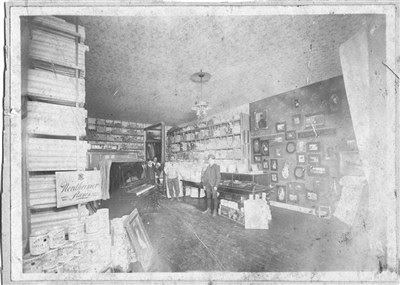 This interior Photograph from 1900 of McMillan and Neff clearly shows the Picture Framing sample wall. Over the years the business has tried it’s hand at many things. Initially the store also sold paint, wallpaper and room mouldings. The interior photograph from 1900 obviously shows a piano for sale. At one time flowers were also sold. In addition the list includes artist supplies, an art gallery and decorative glass. Through it all, Picture Framing has always been there. Although it is hard to say how many pictures have been framed at the store since its beginning, an estimate of "Hundreds of Thousands" wouldn't be far off. Shortly before his retirement in 1965 Harry McMillan was quoted as saying he had been shaping up to 1,400 frames annually. The addition of a computerized point of sale has made recent tallies more accurate and Classic Art has produced well over 40,000 picture frames in the last 15 years alone. Having been around for so long, the owners of the business have learned to adapt with the times and have a unique advantage over almost any competitor. Recent owner Bob Littel will tell you "When you learn a trade using time tested techniques of craftsmanship, and combine that knowledge with modern technology, you have an invaluable combination. It shows in our finished, award winning work. Attention to detail is paramount." What was happening in 1888? For more than 140 years, economic recessions and depressions have come and gone and only the very best survive the true test of time. Classic Art is one of these businesses.